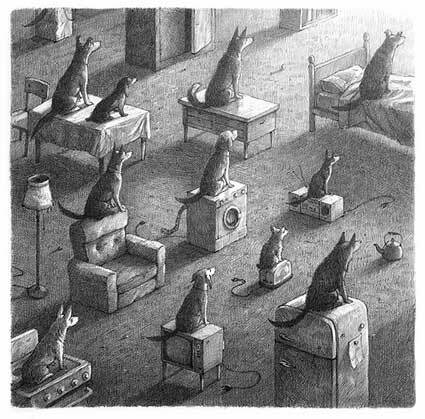 I have been a fan of Shaun Tan’s work for quite a while now, I have most of his books and have written a few essays on him. His work is very different to Emily Gravetts work as he uses a different technique of drawing and portraying a story. Shaun Tan is an Australian illustrator and author who creates science fiction picture books which are recognised all over the planet. He has won an Oscar for The Lost Thing which was a book that turned into a 15 minute animated film. I love this scene as it reminds me of the text I’m currently creating images for; The Library of Babel. The vast area of land which is covered with building after building, no clear land space and is crowded with people. I took this image for inspiration for my previous sketches as I wanted the viewer to be enticed to look into the image more and see more. There is a lot of detail in this image and it has all been done by pencil, so even though it’s not collage I have taken the factors that make this image work and will apply it to mine. All these pointers and more I will try and apply to my work, I doubt it will look as detailed as Tans work but I’ll have a go! Another image from Tan’s book The Lost Thing 2013, A very different style compared to the previous image. More colour in the scene, red being the dominant colour that leads the eye into the scene. 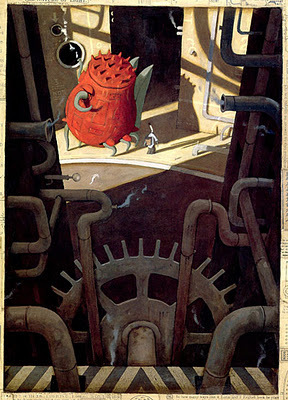 I love the staging of the illustration with the pipes and cogs in the foreground, the main characters and sunlight in the middle ground and the mysterious dark room in the background. The light focuses your eye on to the characters and the leaning of the things makes the scene more interesting as they don’t know whats in the room and it makes me want to know whats in the room ahead. I tend to try and have a background, foreground etc because it allows the viewers eyes to look in depth to the image. I like it how you are looking above down onto the characters it makes it secretive I think. This image is from the book Tales from Outer Suburbia (2009) specifically the story Wake. A story about a man who beat his dog to death but his house became on fire, he saved his appliances by putting them outside where all the dogs sat on them snarling at him if he got close. The house burnt down and as the man was trying to get a weapon to beat the dogs they all disappeared back home once they urinated on each appliance. The story is quite dark but the image is fun and intriguing because they are looking at a house burning down but I want to know what this house looks like? what does the man look like? All in shades of grey there looks like there is a mass of light in front of them and it is funny how they are all sitting on random bits of furniture from a house. The angle the scene is placed is clever as it doesn’t give a lot of clues if the text wasn’t there, this is what John Berger hints on about an image has a different meaning when zoomed in or with text. Ellis., E, 2011, Shaun Tan [internet]. Available from: http://elinaellis.blogspot.co.uk/2011/12/shaun-tan.html, [Accessed 30 January 2014, 2.02pm]. 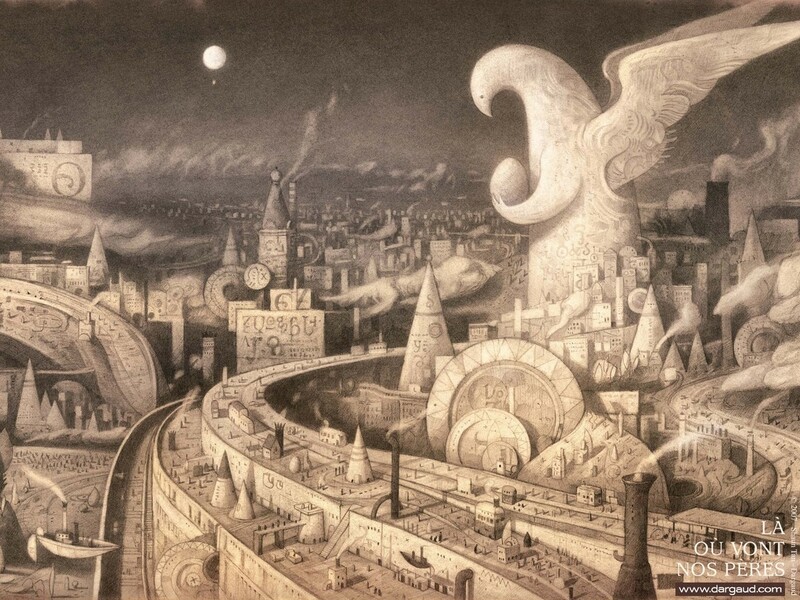 This entry was posted in Artist Inspiration - Shaun Tan.